Halloween is coming! It’s getting cold and I have been on my best behavior to avoid mass amounts of sugar. So, when I was craving sugar (hence the name Sugar + Wine) this past weekend, I decided that I had to earn my sugar. Martha Stewart’s brownie recipe looked simple enough and I had all but one key ingredient so I gave it a go. Now, what was the key missing ingredient, you ask? Well, I didn’t have unsweetened chocolate. Pretty essential for chocolate brownies, right? Wrong. If you want to make these brownies and are lazy (as I often am–I hate grocery shopping: Thank you, Peapod) and don’t want to go to the store, there’s a quick fix. If you have cocoa powder and butter, you can use it to substitute for unsweetened chocolate. Who knew? Joy of Baking knew, naturally. So, that’s what I did and it turned out delicious. I will always note when I mess with the quantity, and with any dessert/sweets I typically halve the recipe because I certainly don’t want to eat them all. Ok, I want to eat them but I can’t if I want to continue to wear clothes to work, which they pretty much require. And, of course, if I bring in 20-40 cookies, brownies, and/or cupcakes to work, my co-workers will begin to hate me for tempting them all of the time. One last thing– I actually never thought about brownie shapes and using cookie cutters to make these brownies cute. It’s a nice touch and I LOVE Halloween so I had to break out my yet to be used Wilton Halloween cookie cutters. You can pick any shape you want! Preheat the oven to 325°. Spray your pan and set aside. To make the chocolate, soften the 3 tablespoons of butter in the microwave in a small microwave-safe prep bowl for about 20 seconds (or less if your butter is room temperature) and mix in the cocoa powder . Then, in a medium or large microwave-safe bowl, combine chocolate mixture, 1 stick of butter, and brown sugar. Microwave for about 30-40 seconds to make sure that everything is melted. Make sure you stir it so that all of the ingredients are mixed. Next, mix in the eggs, vanilla, and salt using a mixer. Slowly add in the flour and mix until creamy smooth. Pour the batter into the prepared pan and smooth out the top. Bake for 35-40 minutes or until a toothpick comes out clean from the center of the pan. Let the brownies cool. Run a knife around the edge of the pan to loosen it. Slowly flip the pan onto a baking sheet to release your brownies. Then, flip over the brownies onto a flat surface. With your chosen cookie cutters, cut out your brownies and enjoy! 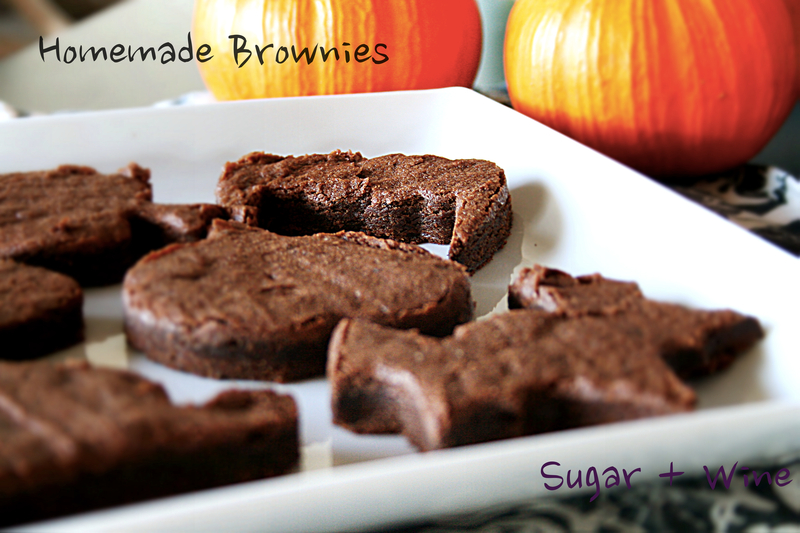 **Note: There will be extra brownie left over after you cut out your shapes. Martha Stewart rolled them into balls and covered them with powdered sugar, cocoa, etc. I chose to eliminate this step but check out the link above if you want to give it a try!